From his humble beginnings in 1938 in Action Comics #1, Superman has almost always been a subject for toy licensing. Over the years, his likeness has appeared on metal toys, games, lunchboxes, and of course, action figures. 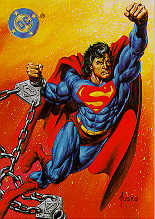 In 1995, Kenner revived Superman for another brief stint as an action figure line. This wasn't Kenner's first experience with the Man of Steel. The company first produced both Superman and Clark Kent (as a mail-in exclusive) figures for the Super Powers line. However, the last time that Superman had been the focus of his own action figure line (or more correctly, sub-line) was during the hype for the original Superman motion picture (the toys were produced by Mego). The Superman: Man of Steel (SMOS) line seems to draw much of it's inspiration from the Superman comics Death of Superman and Return of Superman story arcs as well as the Doomsday/Superman Hunter/Prey limited series. 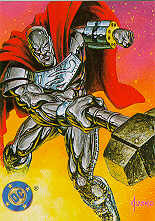 Almost all the characters portrayed in this line played significant roles in these comic series (Conduit and the unproduced Metallo (who later saw release via HasbroCollectors.com) were the notable exceptions). Although the line would only last for two series (due to lackluster sales) there are some impressive items in this line. This is an archive of every item from the SMOS line (including those that never got made). If you have any information or items that you would like to display here, drop us a line. And if you still haven't had enough of everyone's favorite Son of Krypton, be sure to visit our Superman: The Animated Series archive for all the latest news and pictures on Hasbro's other Superman line of toys. Click on the icon or name below to enter the section of the archive you wish to browse. All characters and likenesses on this page are copyright © and/or . This page is non-profit and no harm is intended. Artwork on these pages by Jurgens, Breeding, Guice, Rodier, Jusko and EGM. Superman created by Jerry Siegel and Joe Shuster. This page is not affiliated with either Kenner or DC Comics.